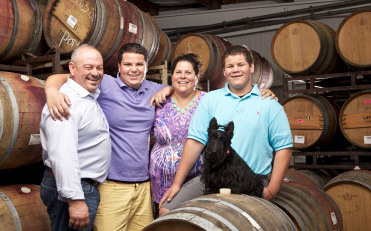 We are proud to be a small, artisanal, family-owned winery located in Healdsburg, California. We have spent most of our lives in the vineyards and wineries of California, so it was a natural progression to start our own winery in 2004. We are pleased to bring you wines made from many remarkable vineyards we tend with our fantastic growers in Sonoma, Napa, Mendocino and Monterey Counties. Each bottle of wine that we offer has our commitment to bring out the flavors realized from the unique terroir of each vineyard. Experience has shown us that each wine is a specific, individual expression of both the fruit and the craft of the winemaker. We are excited to open our doors to you, and wish you a hearty welcome into our inviting tasting room, just fifty feet from the celebrated Healdsburg Plaza, great shopping, and popular wine-country restaurants. Come savor the flavors of Dry Creek Valley, Russian River Valley, Howell Mountain, Mendocino Ridge, and Monterey brought to you in our limited-issue wine collection. We look forward to seeing you soon!